Charles A. “Chuck” Donovan, Rebecca Gonzales | August 24, 2016. Because abortion and abortion policies impact thousands of women’s and families’ lives every day, abortion policy must be grounded on the most accurate, comprehensive and up-to-date statistical information and health data. Unfortunately, after four decades and over 55 million abortions since the Roe v. Wade decision, the United States still doesn’t have a timely and streamlined system. In this report, the Charlotte Lozier Institute (CLI) undertakes a review of state abortion reporting laws, examining statutes and published reports, and talking with state officials about practices regarding gathering and publishing abortion data. CLI graded all 50 states, as well as the District of Columbia and New York City, according to the amount of information collected, the timeline between data gathering and publication of reports, and the ease with which abortion information can be accessed by the public. Data about abortion incidence is of interest not only to policy makers but to courts that are asked to review legislation designed to affect or indirectly affect abortion rates or abortion “access” in one direction or another. Making this data timelier, more comprehensive, and more accessible is a basic responsibility that is within reach and that only government agencies can equably fulfill. 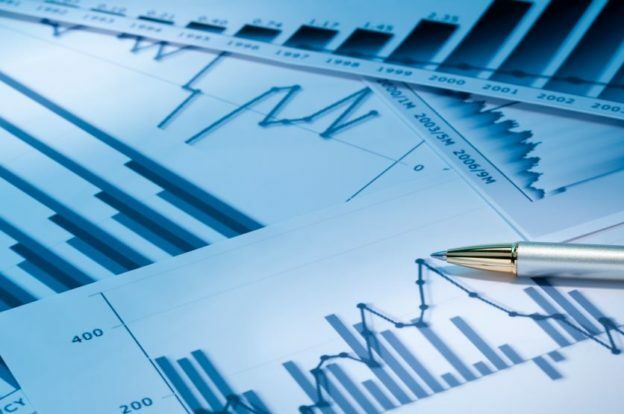 States vary greatly in the information collected and published, with some states collecting and publishing numerous tables and others collecting scant or no information at all. Seven states scored 0 points for not publishing any annual abortion report: California, Maryland, Massachusetts, New Hampshire, New Jersey, Rhode Island, and Wyoming. Oklahoma and Minnesota have the highest scores for abortion reporting. The quality of state abortion reporting is not strongly linked to the states’ attitude toward abortion as measured by its political climate or public policies toward legal abortion. Abortion reporting is weakest in some states that have the highest abortion rates. For example, Maryland, New Jersey, and California have the second, fourth, and sixth highest abortion rates in the country, and yet tie for last in our review as they do not publish an annual abortion report. New York state has the highest abortion rate and ranks 39th for reporting. The District of Columbia has the third highest abortion rate and ranks 45th for reporting. Florida has the fifth highest abortion rate and ranks 40th for reporting. Not one abortion data point is publicly reported for all 50 states and the District of Columbia. The following data points are reported by fewer than 20 percent of the states: method of payment for the abortion; the specialty of the physician, if any; evidence of fetal viability; and type of contraception used prior to the pregnancy and abortion. 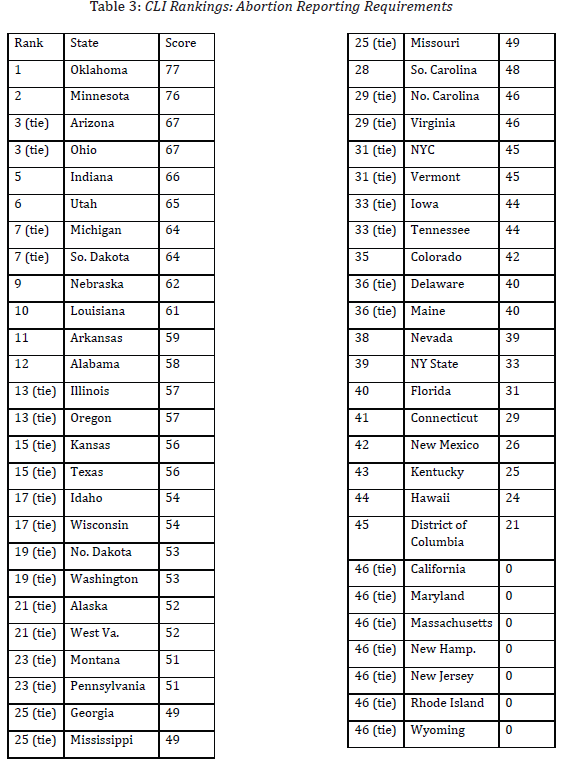 Table of CLI Rankings for all 50 states, the District of Columbia, and New York City. National abortion data for 2012 was published by the Centers for Disease Control on November 27, 2015. The speed of this publication process could be improved and the key to doing so would be more rapid reporting by the states in a more uniform and consistent manner. With a modest cost of $4,000 to produce its annual abortion reports, Minnesota’s reporting system offers a model for any other state wishing to increase the efficiency, completeness, and availability of its reports about the impact of abortion on its population, without sacrificing essential concerns about patient privacy.